With a sum total of 1,032 minutes, Peter Jackson’s six J.R.R. Tolkien films have earned more than $5 billion worldwide. They have made New Zealand synonymous with Middle-earth. And they have slaughtered enough orcs to constitute genocide. The sheer size of Jackson’s accomplishment — a majestic, fully realized fantasy world, from its lush landscapes down to its hairy feet is enough to make Cecil B. DeMille blush. Across craggy mountaintops and through enchanted forests, he has set his hobbits, elves and wizards scampering to and fro, always under the threat of greed, ego and selfishness. More than anything, he has taken the stuff of fantasy seriously and rendered Tolkien’s splendid creation with love. Sadly, all of that was true after Jackson’s Lord of the Rings trilogy. The subsequent Hobbit trio, which is now finally sputtering to an end with The Battle of the Five Armies, will inevitably go down as an unneeded, unloved gratuity, a trilogy, like the second Star Wars run, to write off as overkill. The magic, fleeting to start with, is mostly gone. 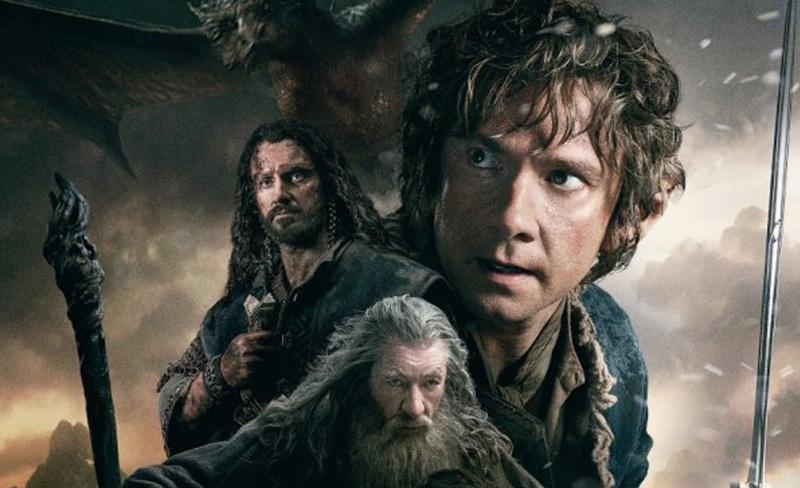 The Hobbit might have been a nice little prequel add-on to The Lord of the Rings, but by dividing it into three movies, Jackson and company have drained the book’s dramatic momentum. The first, An Unexpected Journey, remains in one’s memory only for its clown-car introduction of the 13 dwarfs in an interminable dinner scene I fear is just now approaching dessert. The Desolation of Smaug, for me the most successfully rollicking of these three, brought in (finally) another woman (Evangeline Lilly’s elf Tauriel) and Benedict Cumberbatch’s glorious dragon. What most distinguishes The Battle of the Five Armies is its relative torpor. After five films of relentless forward motion, its characters always in perpetual flight, Jackson’s Hobbit has, as if out of gas, plopped down at the Lonely Mountain. Picking up with Smaug’s fiery escape, Five Armies caps The Hobbit with a Middle-earth melee as all forces gather around Erebor. The riches inside the mountain draw dwarfs (led by Richard Armitage’s king Thorin), elves (ruled by Lee Pace’s wonderfully snobbish Thran-duil), a smattering of humans (most notably Luke Evans’s Bard) and, of course, huge armies of hulking orcs. All the commotion doesn’t leave much room for Martin Freeman’s Bilbo Baggins. The funny, natural Freeman is one of the best things to hit Jackson’s overly earnest epic (it’s an hour into Five Armies before the first chuckle), but he has often been crowded out by the avalanche of characters and CGI effects. Perhaps — and I know this could strike Jackson as incredulous — a battle scene need not be an hour long? The action, too, comes in Jackson’s preferred 48 frames-per-second (theater options will vary; and the film is also in 3-D), which, in the mission of greater clarity, yields a heightened artificiality. Some believe this high-frame-rate is the future (James Cameron is a fan), but for now, it’s the greatest evidence that some 15 years down a Hobbit hole — both pleasingly and frustratingly far from reality — have marred Jackson’s vision. Effects-only shots look fine, but live-action appears like a soap opera. But maybe it’s time to admire Jackson for his obsessions. He has spent a very long time in Middle-earth and his affection for it hasn’t, for even 1/48th of a moment, ever been in doubt. It is his precious.